If interested, a few of us are going to New Orleans for the Jazz Fest. In terms of jazz fest tickets, the prices are $ Protected content per day if bought online and we would attend the Friday, Saturday and Sunday shows (see the link below for more info). We will carpool most likely (but you can always try the Megabus.com option which can be as cheap as $8 - $31 each way depending on how quickly you jump on it). In terms of rooms, you can book your own or if you want to stay at the same resort we will be at..just let me know directly (message me directly...do not comment as I may not read it in the comments) and we can coordinate. 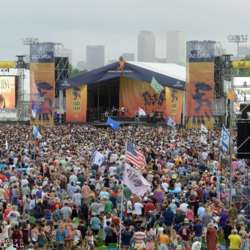 If we get a group going, we can scope out an area at the Jazz Fest at either the Arena or Gentilly stage and make that "ours". The plan is to visit one restaurant each morning for breakfast and at night and have lunches in the jazz fest. We will also visit bourbon street, the cemetaries, voodoo museum, clubs and more during the evening since the jazz fest usually ends around 7pm.